Samsung Galaxy S9 Plus VS Apple iPhone X: Who’s The King Now? Every smartphone manufacturer out there always releases their flagship with specs and features to compete against the best available smartphone in the market. Each of such flagship has a perfect competitor that comes under the same category. However, the competition gets really tough when it is between the flagships from two top brands. Here we have a similar situation where we're comparing latest flagships from two tech-giants, Apple and Samsung. Apple had announced and launched its flagship iPhone X in the market in October 2017. Since then it has been ruling the smartphone market and waiting for a real competitor to fight the battle. As we know, only Samsung can come up with a device capable to compete with Apple. 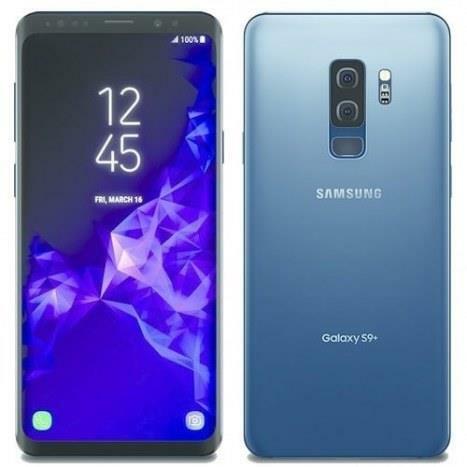 Thus we have here the Galaxy S9 Plus that comes packed with sufficient tech gears which were recently announced by Samsung. Apple being an unbeatable tech-giant coming with their own manufactured chipset and gears, will it be able to beat its real competitor and hold the title for yet another flagship to come? Let us find that out today by comparing these two devices. 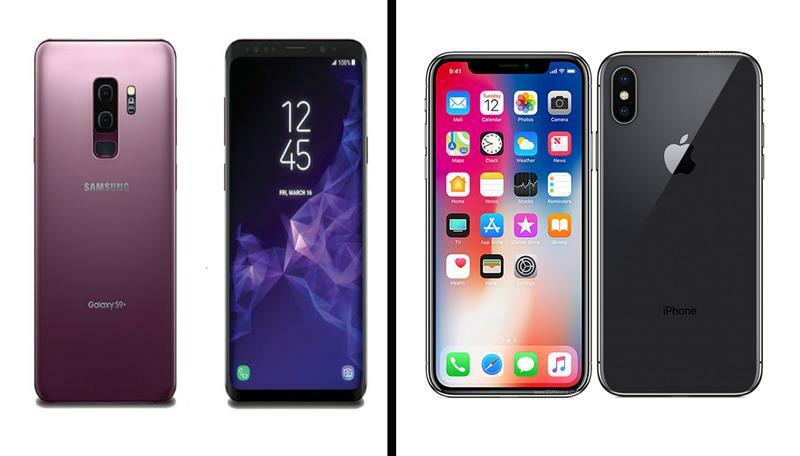 Both being a flagship from top-end smartphone manufacturers, neither Samsung nor Apple has compromised in any field related to its design and build quality. Both the flagships have been provided with a top-notch build quality and premium design. There is glass on both front and rear on both these devices with aluminum frame on S9 Plus and stainless steel frame on iPhone X. 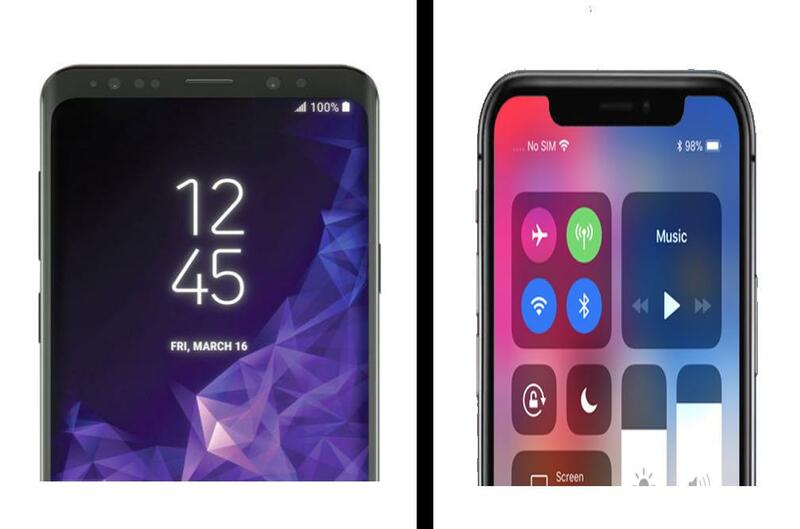 Comparing the dimensions, although both of them spread out a bezel-less display on the front, it is the Samsung Galaxy S9 Plus which has more screen-to-body ratio with 84.2% compared to the iPhone X's 82.9% screen-to-body ratio. However, in terms of thickness and weight, iPhone X is the slimmest and lightest device among the both with just 7.7 mm and 174 grams compared to 8.5 mm and 189 grams in Galaxy S9 Plus. For screen protection, Samsung S9 Plus comes with Corning Gorilla Glass 5. The iPhone X also has its scratch-resistant screen with oleophobic coating to deliver protection against accidental damage. Both of these devices have also added weather-proofing, water/dust protection, and S9 Plus has an added advantage of half a meter more water-resistance with IP68 compared to the iPhone X having only IP67 delivering water resistance up to 1 meter. Another mentionable feature to compare is the headphone jack. While the S9 Plus offers a 3.5 mm headphone jack to hear your favourite songs on the go, just like its predecessors, iPhone X holds no headphone jack, instead, it uses the lightning port to connect your music accessories. The display is the field where both these device stands high compared to other devices in the market. iPhone X and S9 Plus have a Super AMOLED display on its respective bezel-less screen. Comparing the display size, iPhone X comes with 5.8 inches display with 19.5:9 ratio delivering 1125 x 2436 pixels of resolution and 458 ppi of pixel density. Talking about S9 Plus, this field is where its added weight, thickness, and overall dimensions come to benefit as it features a 6.2-inch display with 18.5:9 ratio delivering 1440 x 2960 pixels of resolution and 529 ppi of pixel density. iPhone X features 3D Touch display where you can access this feature by pressure pressing anywhere on the screen, the virtual home button is the only place where Galaxy S9 Plus holds a 3D Touch functionality. Now it is time to compare the powerhouses that are running beneath each of these devices. Samsung has announced its flagship in two variants; one running Samsung's own chipset, Exynos 9810 and another running Snapdragon 845. The first chipset is paired with Mali-G72 MP 18 GPU, the latter comes paired with Adreno 630. If you are confused which variant you should buy, don't worry, it will definitely be the first variant running Exynos chipset. On the other hand, iPhone X from Apple runs on Apple A11 Bionic chipset paired up with Apple's own three-core GPU. While Samsung is running on an Octa-core processor, Apple delivers similar performance with its hexa-core processor underneath. To add extra spice, Galaxy S9 Plus comes running the latest Android OS (8.0 Oreo) and iPhone X with iOS 11.1.1. Comparing both, it is up to user's personal preference, however iOS being Apple's own operating system, iPhone X will have benefits in receiving updates and fixing bugs sooner than S9 +. Talking about the storage, the S9 Plus from Samsung has offered its users three variants to choose from; 64/128/256 GB, while iPhone X delivers only two; a 64GB and 256GB variants. Also, the hybrid slot in Galaxy S9 Plus has an added advantage of storage expandability up to 400GB, sadly there are no such expandability option in iPhone X and users have to stick up with 64GB for life if they choose the basic variant. In terms of RAM offered in both these devices, here too S9+ has upper hands with 6GB RAM while iPhone X offers only half the amount of RAM. But as always the amount of RAM hasn't anything to do with the performance delivered in iPhone X. Now it's time for the most awaited comparison to find out the best camera among the two. By God's grace, finally an S lineup with dual-rear cameras. S9 Plus offers dual 12MP shooters, where one offers a fixed f/2.4 aperture lens while the other delivers a variable sensor giving out f/1.5-2.4 aperture. With this variable aperture lens, S9+ has made a breakthrough in the field of a smartphone camera. On the other hand, iPhone X delivers sensors with slightly lower aperture level of f/1.8 and f/2.4 on its dual 12MP shooter. Here the S9 Plus has got the upper hand very easily as its lenses could easily drive in more light thus resulting in better low light performance. That's just not it, the S9 Plus also delivers a dual pixel PDAF which is much amazing compared to the regular phase detection autofocus system used in Apple iPhone X. Talking about the video recording capability, both S9 and X are made to shoot videos at a maximum of 2160p resolution. S9 Plus has some extra features like dual video record mode, HDR etc. However, in recording slow motion videos, iPhone X is restricted to shoot at 720p up to 240 fps, while S9 has slow-mo at 720p up to 960 fps. So if slow-mo is your thing along with other better camera features, you have already found your champ. Apart from these both these devices deliver an excellent front-facing camera with a 7MP shooter in iPhone X and 8MP in S9 Plus. One of the main areas where people would like to investigate the new devices is the list of features of biometrics used in the device. Talking about it, we have one here with a single biometric system where the key is only your face, whereas on another apart from your face you can input fingerprint and even your iris as the key to unlock the device. So with variable biometric options to choose from, clearly S9 Plus has offered better feature than iPhone X. Although Samsung here has provided a similar face unlock system, it can never beat the Apple's FaceID as it is much better and reliable than S9 Plus's so-called 'Intelligent Scan'. Also comparing the Animoji in X and AR Emoji in S9+, still the iPhone X has done it better as it takes in and out all the human facial expressions without missing any. 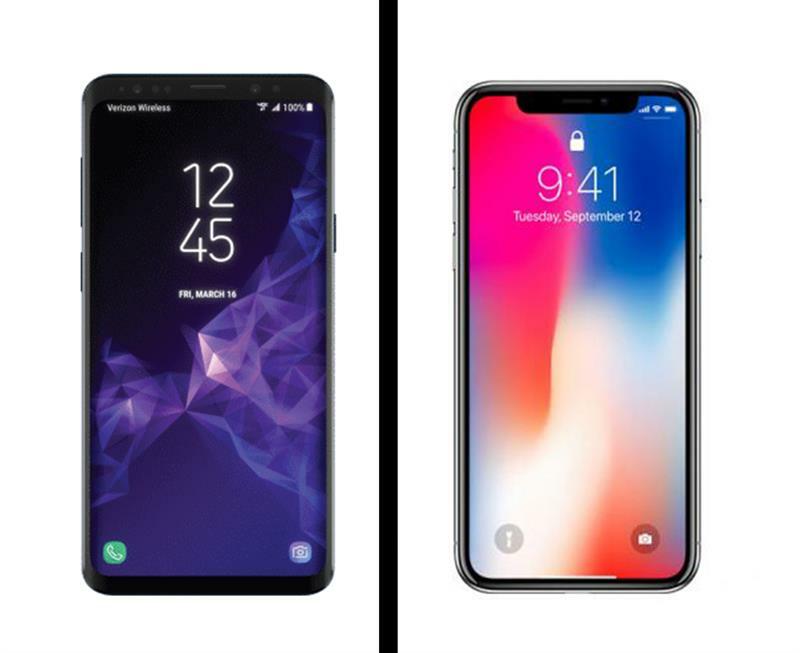 Finally let's compare who is the last phone standing, Galaxy S9 Plus or the iPhone X? Well, on paper we can clearly call GS9 Plus the winner, as it holds a 3500 mAh battery underneath it compared to the iPhone X's 2716 mAh battery. However, in reality, the real winner can only be announced when we test both of them on hands. But while we research back to the Galaxy S8 Plus which delivers the same 3500 mAh battery as that of S9 Plus, the device seemed to deliver much more hours of usage when compared with iPhone X. So the chances of repeating the same story with S9 Plus will be higher. There is a lot that iPhone X as a flagship from Apple has to offer and there's no doubt it has been the king of smartphones out there in the market until the Samsung had announced its two new flagships. While talking about the Galaxy S9 Plus, it has got big and better display, reimagined camera with high-end features, bigger battery and is cheap in price compared to iPhone X. So if you want these features then you know your pick. But if you still love the OLED display, the notch that some claims as an added design, Animoji, FaceID which is far better recognition system and finally the iOS 11.2.6, then iPhone X is still the king for you.